Amid the noise, bustle and music of the Green Dragon Inn nestled on a tall hill at the entrance to the Black Forest, Juliette sat quietly at a table with her family and friends holding a purring black kitten with large orange eyes by the name of Ember in her lap. Everyone was eating and looking around and listening to the music being played by the fiddlers and drummers at the far end of the tavern. Things were lively and everyone was having a good time, as the landlady, Lucia, attended to customers with food and mugs of ale. As she pet the purring kitten Juliette thought to herself that she didn’t really feel like giving up Ember to Old Biddy Mable and might just keep the adorable little thing for herself. Morgana, brooding over her soup, commented under her breath that Mr. Montague was watching her, but Juliette preferred to think he was really just watching the mysterious fiddle, which he expressed extreme interest in earlier. Morgana seemed unconvinced, which worried Juliette and Storm Pig a little, but nothing more was said of it. Morgana took out a small pouch tied by a silver cord. In it were her mystical tarot, very beautiful. Juliette draw the first card from the Tarot Deck, the Earth Card of Omri the Bull. Morgana commented upon the auspicious omen, as he is a strong ally of Minvar, who is both Morgana and Juliette’s patron Elkron. Storm Pig then drew from the deck with his hoof the Card of Minvar, which it was agreed was even more auspicious. There were smiles all around. Across the room there was a commotion. Juliette stole a sidelong glance. It was Mr. Montague. Somehow Coal Fire, Ember’s sire, was on Montague’s table, and somehow a candle got knocked over and caught a basket of dried flowers on fire, and then Coal Fire in fright leaped on Mr. Montague’s head, a pint of beer spilled, and in a flurry of panic and curses, he fell over with a thud knocking everything off the table causing quite a ruckus. When he saw that Juliette and her friends were trying hard to hide smiles to themselves, he gave them all a very mean glare, and then after a deathly-silent pause, arose, brushing himself off curtly, and roundly cursed the black cat again. He stalked off to the bar for more ale as CoalFire scampered up to the top of a tall liquor cabinet and watched Mr. Montague with bright orange eyes. There were little smiles masked by hands and shoulders at Juliette’s table. After a while the scruffy little fiddler who had left his fiddle with Juliette earlier came through the tavern door, blowing snow in from the darkness behind him. He looked around briefly with a smile, stamped the snow off, and promptly headed to the bar to pay the bartender what he owed him. Satisfied with that he carried over a mug of ale and thanked Juliette for watching his fiddle for him. She of course let him know that Mr. Montague was interested in buying the fiddle for a great sum of money. This struck the fiddler, whose name is Timmy by the way, as utterly ludicrous, as he insisted the fiddle was practically worthless. Storm Pig found this rather interesting and considered buying the fiddle for something less than what Mr. Montague had offered (which was a fortune), and pocket the remainder after selling it himself to Mr. Montague. But after some thought, he began to doubt. He speculated that the two men might somehow be in league, and so he left off from buying it after all. And so, without much ado the fiddler drank up his beer, played a few notes, and as the evening seemed to be winding down, thanked Juliette again, and bid them all good night, giving Mr. Montague an odd frown on his way out the door. Everything had grown quiet as the revelers departed out into the night or upstairs to their rooms. The fires were burning low. The Adventurers were tired, and so they begin thinking about settling down for the night. Lucia, their lovely hostess, offered to take Storm Pig to the barn, where he might have a comfortable stack of hay to sleep on, as she explained they didn't allow animals to sleep in the rooms. This caused a bit of consternation on Storm Pig’s part, and he pointed out, as politely as he could, that he was Not a pig. He gave a backwards nod to his wings. Lucia looked at him again. Tuft of boy’s hair, wings, talking… she agreed. And so she offered him a small room, and they accepted the hospitality. Everyone went to their rooms, which are all quite cozy, and slept for the night. Ember spent the night wrapped around Juliette’s neck, purring away as kittens are wont to do. And for her part, Juliette thought of Old Biddy Mabel, poor lonely old dear, as she dosed off to sleep, thinking all the while that Ember was too adorable to give up. In the middle of the night Storm Pig awoke to discover a shadow sitting on his window sill. The glass was brightly frosted in the moonlight and a large black bird with a red beak and talons was staring down at him gravely. It gave him a long penetrating look, and then with a caw flew off into the star laden sky. Storm Pig decided that, unlike most people, and most pigs, he could follow the feathered shadow, and so he did, flying off after him on his little wings into the night. He followed the black bird over the beautiful glittering snow bound vista, high over the snow covered forest hills, over deep black ravines roaring with waterfalls. Far they soared in the frigid winter air toward a great hill in the distance. The black bird flew just above the trees making it somewhat difficult for Storm Pig to follow, but he managed to keep up barely. A few times he thought he lost the red and black flitting shadow ahead, but each time he caught site of it dancing in the wind over the treetops. The black raven flew down onto a long wide ridge of a broad dark hill and landed on top of an ivy covered mound peppered with brier patches draping its shoulders. Several young trees were growing up on the top of the mound. It was steep and tall, and quite out of place looking at the edge of a small glade bordering the shadowy forest behind it. The bird landed on a branch of one of the young trees, and as soon as it did it cawed once loudly, and Storm Pig awoke in his bed with a jolt. He was back in his room at the Green Dragon Inn panting wildly. It was a dream. And he happen to be fully human again. In the morning everyone woke up to the sound of a tinkling bell, which was Lucia’s breakfast call. The air was filled with the aromas of many delicious foods, like fresh bread and eggs and potatoes and onions and plenty of bacon, sausage, ham, all fresh from Hamfest. Juliette staring at the board spread with pork products, wondered what Storm Pig would choose for breakfast, when he came out of his room fully transformed back into his normal human self to her surprise and joy. He seemed quite pleased about this, too, stretching his arms and stomping his feet merrily, though the other patrons took little particular notice, as though they’d rather forgotten all about the talking pig with wings of the night before. Perhaps they thought it had been a dream. Breakfast was had with delight, and it was sumptuous, and Storm Wizard ate a bit of everything without any scruple whatsoever, as did everyone else at the table. Juliette eventually noticed that Morgana had not come downstairs for breakfast. She didn’t come out of her room. Juliette decided to check on her and after knocking twice opened the door to discover the room was empty. Peering about she noticed the window was open. She looked over the edge of the sill down below and saw two tracks of footprints in the snow heading off toward the looming forest. As the Inn was situated on a hill so that the second story where the rooms were happened to be almost at ground level outside. And so with a ten foot drop one could land easily on the ground. Juliette ran back downstairs and scanned the tavern hall for Morgana, and for anyone else who might be missing. Ben, still eating heartily, looked up and noticing Juliette’s distress, mentioned that there was indeed someone else missing. Mr. Montague. It was known that he was a patron staying for a few nights at the inn, and it seemed a bit peculiar that he too had not turned up for breakfast. Juliette thought about the fact that there were two sets of tracks heading off into the woods to the north east. She grew very wroth for a young girl. Her brothers grew angry at this outrageous prospect, and so 'The Steel Wool Sheeps' Adventure Guild Group quickly grabed their gear and prepared to depart into the forest. They intended to follow Morgana and Mr. Montague's tracks, wherever they led. Morgana’s mystical Tarot Deck was found laying on a table when they came down stairs, and Juliette collected the cards and put them in her sack. It was odd that they should have been left laying about as Morgana would normally keep them carefully. They decide that there was no time to waste because Morgana was in danger, and so Juliette tucked Ember into her cloak and they headed off immediately in a great rush, entirely forgetting to pay their bill. Lucia, who had overheard their conversation from a small distance hurried onto the porch after them and with a wave good bye wished them to fare well and have a safe return. And should they be so lucky, she hoped they would pay their bill. Fortunately, it had been snowing and so the tracks were not terribly hard to follow. But the terrain was difficult in the hills because of the steep ravines, craggy ledges and gnarled trees that were thick with many twisted roots. The trail was covered with snow and ice which made progress slow. Nevertheless, they kept a steady pace. The path was through the tall narrow hills was difficult, and in many places quite perilous. After a few hours they come to a lumberjack’s encampment. It was situated along the edge of a defile, and upon it a stand of tall pine grew amid the great old oaks. Tents could be seen clustered around a central fire pit. Through the foliate they saw a large burly man stirring a cauldron with a huge black spoon. They snuck up to the edge of the camp to take a closer look, and watched as the lumberjacks went about their business, oblivious to the strangers. Storm Wizard suggested that some of them, Juliette in particular, should stay behind while he, Brian and Daniel ventured into the camp to see what they could find out. And so he took his brothers along a narrow path into the camp. The cook took a sip from the pot, smiled, and humming to himself went back to stirring. He seemed content. Then he saw the three boys heading up the trail. As soon as he saw the three young men approaching he stopped and grimaced with a huge bearded frown. “Good morning.” offered Storm Wizard. “It’s morning alright!” said the large man, “but I don’t recall what’s all so good about it! What in tarnation are you folks doing way up here? !” he demanded gruffly. But the lumberjack just turned and walked away with a bewildered grunt. The cook still stared down at them wide eyed and motionless with his hands on his hips. A look of utter surprise was frozen on his face. “Um, we were wondering if you happened to see any travelers pass through your camp earlier today, or perhaps last night?” asked Storm Wizard tentatively. “Ah well, we’re well aware of that, but one of our companion was kidnapped”, replied Storm Wizard with his stern and determined tone. “Yes, really,” answered Storm Wizard. Brian and Daniel both nodded emphatically. “We followed their tracks through the night and they came to this camp. They may have pass through unnoticed,” suggested Storm Wizard. “Laraby!” called the great man. Out from a tent stepped a thin middle aged man, clean shaven with blond hair. He held a small book in one hand and a writers quill in the other, and was wearing a pair of bronze rimmed spectacles, which he removed and gave the young men a look over. “Um, yeah, Bill?” he asked in a civilized and calming tone. “John Bellowick, sirs,” answered Storm Wizard with a bow. "These are my brothers Daniel and Brian." "Nice to meet you, sirs." they said as they made short bows toward their hosts. “A friend of ours was kidnapped,” answered Storm Wizard curly. Mr. Laraby Jones gave them all a penetrating look. A few moments he decided to help the youngsters find their friend. Lumberjacks and their ilk don’t take kindly to kidnappers, after all, and the young people were reassured. And so it was decided to introduce Laraby to the other members of the party. There were brief and hurried introductions, and a good deal of surprise at seeing a young girl like Juliette there. But with little ado, Laraby leading the way, they followed along the edge of camp and picked up the tracks again on the far side heading North East into the forest. “Hmm…,” said Laraby, “that doesn’t bode very well, my young friends. That unfortunate direction heads off into the wilderness far yonder up towards Black Hill. Folk won’t go anywhere near Black Hill, I'm afraid. They say people never come back from there, and folk say that old hill is haunted by ghosts, and that dark things dwell in its shadow. A bunch of nonsense no doubt, but still, the way is dangerous, and this forest has wolves.” Ben, let out a little gasp that that and muttered under his breath, "... wolves...". But even so, there was nothing to do but follow the tracks, and Laraby as it turns out was an excellent tracker. To keep their spirits up and while away the time as they marched Laraby kept up a low level chatter about his life and adventures. He was, he commented at one point, actually the camp doctor. Hunting and path finding were necessary skills he’d learned up in the hill country. And so, as it happened, the 'Steel Wool Sheeps' were fortunate that Laraby happened to be in the camp that morning, and decided to join them, because the first thing he did was cart them all back into camp for provisions. Hard biscuits, jerky, torches, spikes, a hammer, sleeping gear and plenty of rope. All the things one might need for a adventure through the deep woods and dales of the Black Forest. Everything was wrapped up by old Bill Higgens, the cook, and put into carrying sacks. Brian and Daniel did the heavy lifting and off they went after Morgana and Mr. Montague. It wasn’t an easy journey by any stretch of the imagination, as the hills got steeper, the ravines darker, the water falls higher, the ice thicker and the snow drifts deeper as they trekked ever upward following the thin ribbon of tracks through the snow. Sometime late in the day they were passing over a narrow gorge along a treacherous cliff-side trail when Black Hill finally came into view. The top of the hill was obscured by clouds, but it was snow covered, forested, tall and wide… and somehow they all felt that in distance it looked ominous, though it would have been hard to put your finger on exactly why. Storm Wizard remembered the dream he had the night before and even though he wasn’t seeing the hill by the light of the moon, he recognized it clearly. He knew where the path they were on twisted and turned, and he knew how to avoid the rough spot ahead. Laraby remarked that it seemed Storm Wizard might be an even better path finder than himself, though Storm Wizard didn’t mention how it was that he happen to know which paths lead over ledges into ravines and which would wound back around onto the edges of the cliffs and continued safely onward. Laraby had never been this far into the Black Hills territory, and it made even him a little nervous. That Storm Wizard could pick out the way he considered fortunate. Ben began shivering, and had a difficult time keeping up with the others. And so Laraby would occasionally stop and bend down to pick up a rock, or a piece of moss, or scratch at a bit of bark, jot down a few notes in his book, and once or twice look Ben with a little smile, and mention the object’s name and perhaps a few words about it’s use or significance. Ben was quite grateful for these slowdowns, and tidbits of knowledge, as he had never heard the half of the local lore he thought he had. No one complained about these pauses as it gave them a few precious moments to rest. But still, on everyone’s mind was poor Morgana in the hands of that awful man, Mr. Montague. And so they hurried along. Along the edges of high cliffs surrounded by forests of high and mighty pines the party marched until it was nearly sunset. At that time they came down the last of the cliff trails, along a rock strewn slope, and from there they found themselves standing at the base of Black Hill. Tall and wide it was covered in the verdant luster of a primeval forest of oaks, presently draped in a white cloak of snow. Countless beasts of every kind roamed within that old forest, and the canopy was dotted with the roosts of sparrows, blue jays, crows and other birds, and yet there was a great hush over the land as if it were waiting for something. There was a brief pause when they heard a distant howl upon the wind. They debated if they should stop there make camp and rest till morning, or forge ahead. Onward they went even though it were dark. After all, Laraby pointed out, they had brought provisions from the lumberjack camp, and had torches handy. And so the little band trekked across the flat rocky plane toward the forest of Black Hill, and coming to a babbling brook that burbled its way along the rocky stretch they crossed over via a line of stones. And so they came at last to the base of the forest. Up into the dark woods they followed Laraby who was using all of his path finding skills to keep them from getting hopelessly lost in the primeval wood. Storm Wizard was reflecting on the familiarity with the hill he felt from his dream. He knew that at the top they would find a strange set of mounds covered in ivy and bracken and briars and small trees growing on the top of them. He did not, however, know what they would find there. And so eventually, after they had climbed the steep forest road (for they eventually noticed that the way upward seemed to them to have once been a road long ago as impossible as that may have seemed) they came to a level part of the trail surrounded close by on all sides by huge old oaks. At the edge of the forest the party stood, hiding amid the leaves looking across an open field along which they could see a trail of foot prints through the snow. It was the tracks of Morgana and Mr. Montague. Still fresh. Apparently the party had very nearly caught up with them. They followed the footprints and ascended the middle mound by way of a narrow sloped ledge that was covered with ivy, brambles, and tree bracken, but nevertheless made a straight path between two mounds and allowed them a way upward. As they climbed they noticed two things. One the ramp was in fact an ancient stairway covered in the forest refuse of many ages. And two, that Laraby had vanished. They tried in vain to call out to him in whispers, but failing that, it was decided that they best forge ahead just the same. “Unreliable sort”, Storm Wizard commented bitterly, and they continued the ascent into the dark unknown. They came to the top of the ramp, climbed over a fallen log tangled in ivy, and entered onto a flat gray platform that dropped off into darkness to the left, and was bordered along the right side by an ivy covered stone wall. Along the platform they crept as quietly as they could, holding their torches above their heads and trying to get an idea of what lay about them in the darkness. Across the gulf to the north east they could discern dimly another ivy covered wall that seemed to curve away into the shadows, but there was no direct way to get to it that they could see. One thing was for sure. The fall from the platform downward was quite far. They then caught a glimpse of a dark narrow slit in the wall. It looked like an archer’s window with a short cross bar. Brian put his torch though to see if he could tell what was inside, when a ferocious wind gusted, blowing harshly on his torch making it shutter with a bluish light, and in that wind they all heard a low growl. Everyone froze as Brian jerked his hand back with a gasp. The party edged up along the wall toward the far side of the platform toward another, larger opening. It seemed to be an open doorway into darkness. Through it slid a darker shadow, lean and low, with a deep low panting, and then a low trembling growl. Yellow fangs glimmered in the torchlight. Everyone froze except for Storm Wizard who lifted his voice in calming chant, and with his fingers leading he directed the energies of his mystical body into a well rehearsed spell which the Adventurer’s Guild had unimaginatively named Stun Beam. He threw the dark beam at the tensely crouching shadow just before it could spring at them. And as the spell’s black ray hit the wolf in the eyes it fell down in a heap without so much as a yelp, fast asleep. Brian, the closest, and the most frightened, took his dagger savagely to the beast’s throat least it waken enraged and kill them all. At that moment they heard a rustling noise down below them in the darkness and then around a corner of some dark ivy covered wall came torchlight, and there was Mr. Montague holding Morgana far below them, struggling, on his shoulder carrying her across a courtyard of stone slabs toward another mound onto which, they could barely make out by the torchlight, a flight of stairs going upward. They needed to get down, fast, but from where they were they only knew of the doorway behind them through which the wolf had come, and they did not have a good feeling about entering into that unknown in the hopes of finding a way down to Morgana through some dark maze. They had only moment’s to spare. Ben quickly made a knot around one of the iron spikes from the provisions bag, and slid it through the arrow slit, tuned it, and tugged. “Here”, he said, “an anchor for our ropes.” And with this they discovered they could quickly slide down, and this is just what they did. They ran as fast as they could across the dark courtyard toward the flight of stairs to try to intercept Mr. Montague, but he was already up the stairs before they could get there. Into a dark stone archway he ran. Before they could chase after him, however, they heard a shout from behind them. "Stop!" the man roared with a booming voice. He was a man in a brown robe, his head covered by a hood. He chanted at them. Storm Wizard chanted back. And because Storm Wizard was faster, and had greater luck and greater skill that night, a flash of lightening glinted on his silver dagger and shot into a stone at his feet. Instantly, there was a flash of blue light in front of the man and he clutched his chest with a cry and flew backwards into the dark arched doorway from which he had emerged. The party turned about face and bolted up the stairs after Montague, and into a dark archway. On the right they passed an iron gate that lead into an open space on the other side of which they could make out stairs of stone leading upward, but they did not go that way. They kept after Montague’s torchlight, instead, receding in the distance, and which vanished in the light of other torches along the walls further inside the tunnel. Juliette guessed and turned right when they came to a T-section at the end of the arched tunnel. They found themselves in a narrow open air canyon between two tall stone walls towering some thirty feet high, and could see stars directly above them. Following the cobblestone passage away way to the right they saw ahead two doors, one on the outside wall being further on, and the one on the inside wall, closer, and ajar. They went into that door which lead them into a ten foot stretch of corridor. They were inside again, and on the right side they found another stairway, beyond which was what seemed to be a large room, well lit by torches. Juliette guessed again and took the stairs going upward. And so they ran around the curve of a narrow tunnel of stairs upward quite a long ways, and came to a wooden door that was half ajar on its hinges and through which they could see night sky. They ran out onto a cold rooftop parapet that formed a circle about forty feet wide, and in the center of which was a dark sunken area of broken logs, brambles and vines. And there they spied the huddled form of Mr. Montague clinging to the side of the wall, holding Morgana near the edge, threatening to fall over the edge with her. He seemed to be ready to hurl her over the edge, or himself, and about to do something terrible when Storm Pig gambled on his good luck again. He said this with such an air of great and ancient authority, and such sincerity and gravity, that even to himself he sounded rather more than half convincing. The poor man, now at his wits end, let the poor girl go, and twisting about in fear, stumbled on a slick stone, got his foot tricked by an ivy branch, and toppled head first over the edge of the wall, vanishing into the darkness below with a shriek and distant thud. Far down below them they could see the same brown robed man came running with a torch in his hand to the crumpled figure laying on the ground unmoving. The last we hear as the scene ends is Morgana weeping on Juliette’s shoulder, and the sound of Storm Wizard cursing under his breath. I'm working on a Tarot based Back-Story development methodology. I'm in the early stage of development on how I want to do this, but I like what I'm seeing so far and thought I’d post a bit about it. I certainly like the concept at any rate. Here are some work-in-progress thoughts. 1. I have fit the Tarot onto my alignment wheel, so each card represents an alignment that can be used to help build back story elements. 2. 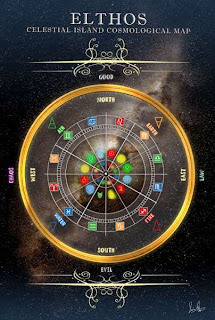 The cards themselves have symbolic correspondences that can be used to fill in story Characters who are representative of Elkron Powers (the Elkron are the Jungian Archetypes and Celestial Forces of the World of Elthos). 3. The cards can be used to give the Characters Tarot Readings as per the normal style which one sees such readings given (ie - different spreads that can reflect on past, present and future, obstacles in the path of progress, inner or outer world considerations and reflections, etc). 4. The cards are also tied to a point system that reflects where the various Elkron are in terms of relative power to one another. 5. The cards can be used as a Fate Point type system to dole out Fate Points to players, which they can use to potentially alter the effects of roles (along the lines of my earlier ruminations about the Poker-Fate Chip system). There would be an associated risk to pulling from the Tarot Deck for the purpose of gaining Fate Points, which is that some cards are ill-omens, and could induce counter effects. This is to keep players from simply pulling from the deck constantly to gain point advantages in the game. The weighting of that risk is important, however, to the success of this particular method, and I am considering different methods of weighting. 6. The cards can be used as markers for specific Characters that act as Flags / Tags for them to be used when they come in contact with Elkronic Forces within the World. I'm going to focus for now on #2 where I use the cards to fill in Elkron influenced characters in my Campaigns. For example, lets say the party is heading into an underworld area that I know is heavily influenced by Scorpio/Death/Pluto. I might have that card already assigned to that part of the map and when they enter the area I look at the existing cards in the player character's hand. Oh look, I notice that Juliette is holding a Card of Taurus/Dragon who is the Hierophant. Behold, as they come to the path that leads down into the great cavern they come upon an old man who gives a short bow to Juliette, and holds out his tin cup. "Alms for the blind," he says. She, being the nice girl she is, gives him a silver piece, and he tells her that if she and her friends are intending to enter the yonder caverns they must be prepared with Elder Wood Staves (which can be found in a grove not far away) for inside the cave is ... etc. It's an interesting concept, I think. I love the idea of incorporating the Tarot into the game. In my case I'm working out a pretty complex methodology for using the tarot in a number of different ways, but of course that's not really necessary to use the tarot in your game and have fun with it. I'd be curious to hear if people are doing similar things, and how it works out. As I wrote this and mulled it over additional thoughts come to mind. One is to let players pull a card when they want. They might do so for example when they are in a tough situation in the hopes they can alter their destiny. Or when they are confused and looking for some clue from the celestials that might help them. Of course without some mitigating risk the tendency might be to pull cards willy nilly whenever something comes up. So I'm thinking about ways to introduce risk to the pulling of the cards. While I might not want the risk to be 50/50 good/bad effect, it should be a method that can be balanced with whatever ratio good/bad the GM decides on for their world. So here's what I'm thinking. The Player / Character pulls a card. Let’s say in this case Juliette pulls The High Priestess. Aside from any other effects, and just talking to the use of this as a Fate Points system, she gets 2 points. It's a Lawful Good card which means she can rely on the outcome being favorable. She can now add two points to any rolls to influence her fate, either in combination or one point to two different rolls. Now Water Wizard a little later, for the sake of the example, is in dire straights. He decides to take a chance and pull a card. It comes up The Tower. 14 points. But it's Chaotic Evil. That means there is a 50/50 chance that when he uses any of those points on a given roll they will either give a bonus or a minus. The GM will roll that after he declares his decision to use the points from that card. He has 14 points from that card. Characters can only hold one card at a time. When the use all of the points for the given card it returns to the deck. alignment), and not spend the points. But if the card is chaotic evil it might be better to try to spend the points as quickly as possible so you can offload it and get out from under it's baleful influence. GM adjudication required for that aspect, of course. Lawful Good: The card's points always add a bonus to the chosen roll. Lawful Evil: The card's points always add a minus to the chosen roll, and the Elkron can activate those points at any time (GM can choose any roll to apply them to). Chaotic Evil: The card's points have a 2/3 chance of adding a minus to a chosen roll, and a 1/6 chance of adding a bonus, or the Elkron can activate those points at any time (GM can choose any roll to apply them to). Chaotic Good: The card's points have a 2/3 chance of adding a bonus to a chosen roll, and a 1/6 chance of adding a minus, or the Elkron can activate those points at any time (GM can choose any roll to apply them to). There are some more subtle spreads I can do depending on if the card is Lawful Good, or Good Lawful, etc, but I think what I have there is a simple yet effective spread. Something along these lines might be workable without being overly complicated. I like the variance, and it reflects the nature of the Elkron in relation to alignment. One thing I would say is that the Characters usually will not know which card is in which alignment until the get much more versed in the Elthos Tarot, and that knowledge is probably reserved by Mages and the like generally speaking. Just finding out which Cards do what might be the goal of entire quests possibly. Some knowledge on the Tarot will be generally known, but some will be losts in the mists of time. There are mysteries within mysteries when it comes to the workings of the Elkron. Religious followers of the various Elkron might be affected by the cards in different ways as well. And also the cards themselves might possess powers of their own, be sentient perhaps, and seek to influence events in subtle ways, among many other possibilities. There's a lot that can manifest from the use of these jungian symbols and their celestial correspondences. The more I think about this, the more I think the method will work. But play testing will tell. My questions will center around the usefulness to the players, and whether or not it establishes the right mood and atmosphere for the appropriate use of the cards. Of course how well it works will depend on the Gamesmaster's narrative skills in terms of how they choose to bring the cards and their effects into the game. A lot can be done with the kinds of ideas that you were suggesting CornMuffin, and the longer a character holds a given card the more likely it is that the card will begin to manifest its energies. Eventually, when I formalize these ideas after much more play testing I will publish something on my findings and suggested methods of using the cards. I have been tinkering away on the web application, and I think it's coming along well. Lately I've decided to work on the look-n-feel and so having received some helpful feedback I've made some improvements. One thing I noticed is that when it comes to look-n-feel people have different tastes. What one person says is fantastic another says is awful. So how can anyone come up with a site that looks good to everyone? Well, there probably is no way to do that, and so we have a concept of site themes which allow users to select their own look-n-feel. That is coming along well, but in order to make it work I have to revamp the pages to take out my specific colors and styles and introduce ones that will be gotten from the cascading style sheets. Since I haven't done much with CSS before this is a learning experience for me. Its interesting, but there's a lot to learn. The good news is that I'm making good progress on it, and soon will be able to update the site with customizable interfaces. Another thought is to allow users to upload their own CSS sheets, but I'm not sure about that idea yet. Maybe. Anyway, I'm pleased with the progress. I think people will appreciate this aspect.